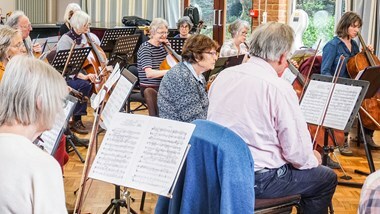 We are delighted to welcome Robert Hodge, Musical Director of the City of Cambridge Symphony Orchestra and Stoneleigh Youth Orchestra, to lead this popular course. As part of our anniversary celebrations, this year we will work on Grace Williams' Sea Sketches (1944), Lennox Berkeley's Serenade for Strings, Op 12 (1939) and Elgar's Introduction and Allegro for Strings, Op 47 (1905). Robert is a conductor known for his considerable skill, clarity of technique and good rapport with musicians. He devises exciting programmes that are enjoyable and challenging for players and audiences. Ideally, you'll have some experience of playing in an orchestra and be of at least Grade 5 standard - and game for some exciting challenges! This course will again run alongside Christopher Gayford's Conducting Summer School, and we are offering the chance for collaboration during the afternoon break for those who wish to work with some aspiring conductors.